Overall Length: 5 feet, 50 ohm feed impedance, no ground radials. Antenna feedpoint is 10 inches above the connector. U clamps, hose clamps, etc. can be used for mounting up to the first 10 inches of the antenna without affecting performance. Antenna offers “true” ½ wavelength radiator at both VHF and UHF. The published papers on these antennas are attached. Building these antennas are difficult because of the scarce availability of materials. Twinlead has long been obsoleted. All of our twinleads are special ordered from JSC wiring. It is 300 ohm open air ladder line design for transmitting. Also the ability to measure velocity factor is difficult and is absolutely necessary for this antenna to operate effectively. One can use 450 ohm open ladder line but it will not fit into a 3/4 inch 200 psi pvc pipe and is also too wide spacing for UHF. Thus we make this design available to the general public at reasonable cost. Don’t be fool by claims of dual band performance. Although traditional VHF J-pole antennas will resonate at UHF, they suffer a –6dB loss at UHF over a ¼ wavelength groundplane. We see many claims of dual band performance sold on the internet but when we purchased many of these antennas they are just VHF antennas that also resonate at UHF. At UHF most of these imitations have horizontal loss of -6dB. Examples of these are "copper J-poles", "slim jim", "arrow". I first introduced the concept of this antenna in Feb. 2003 QST. It is the same antenna that appears on the front cover of the ARRL VHF/UHF Antenna Classics Handbook. It also won the best paper of the month award. It offers true ½ wavelength performance at both VHF and UHF with no ground radials. SWR is less than 1.3 to 1 on both bands. The antenna has been so successful that it has been adopted by the Red Cross, ARES and numerous municipalities for emergency deployment. Copies of these agencies evaluation reports are available by emailing me. A good benchmark is if an antenna configuration does not appear in a ARRL publication, it probably does not work as claimed. This antenna is complete with exception of the 5 feet of ¾ inch Class 200 PVC pipe needed for the antenna. Individual shipping of the 5 ft antenna is $14 so we rather you go to Lowe’s (stock # 23990) or Home Depot (SKU #282-477) or Menard (SKU #6899684) and buy the PVC pipe for about $1. If you cannot find the PVC pipe, I can send it, but you will need to pay the postage. Please email me if you need me to send the PVC pipe. The antenna is pretuned for 144-148 MHz and 440-450 MHz for ham bands or 152-157 MHz and 460-470 MHz commercial band/MURS/GMRS. Please indicate with your order which antenna you wish when ordering. When deployed, it will give about +6dB of gain over a rubber duck antenna. It comes complete fully assembled with end caps and an SO-239 connector. Just insert it into the PVC pipe and you are ready to go. Please email me if you wish an N connector and/or a 250 watt version. The 250 watt version is $20 extra. The antenna has a lifetime warranty. Just return it and it will be either repaired or a new one sent to you. This is our latest antenna featuring coverage in a single antenna - 2 meters, 220MHz, and 70cm. Operates without radials. This antenna was designed for FEMA and is ideal both as a base antenna as well as an emergency antenna. Because of the intricate tuning, we only sell this antenna with the pvc pipe. This antenna is ideally suited for the new triband radios from China. Unfortunately this increases the shipping cost (between $10-15 depending on your location from California). If you are on the East Coast, Kai Chen K2TRW, stocks our antennas. Kai visits the various Hamfests and Dayton during the year. He can be contacted at KB2TRW@gmail.com and his website is WWW.DMR-AMATEUR.COM. His phone number is 201-660-5051. SWR: less than 1.3 to 1 over a 6 MHz bandwidth and less than 1.7 :1 over 10 MHz bandwidth. This is a 3/4 wavelength J-pole optimized using JSC 1220 custom twinlead. This antenna has been fully tested to 150 MPH winds using Lowe's 23990 and 3/4 inch pvc pipe. It is totally UV protected and should last easily 10 years on a repeater mountain top. Overall Length: 4 feet, 50 ohm feed impedance, no ground radials. Antenna feedpoint is 10 inches above the connector. Conduit U clamps, hose clamps, etc. can be used for mounting up to the first 10 inches of the antenna without affecting performance. Antenna offers “true” ½ wavelength radiator at 223.5 MHz (centered tuned). Connector available in both UHF or N.
SWR: less than 1.3 to 1 over a 3 MHz bandwidth and less than 1.5 :1 over 4 MHz bandwidth. This antenna was first presented at Pacificon 2010. It was based on a grant given to us by AC Daughty Inc. in 2010. 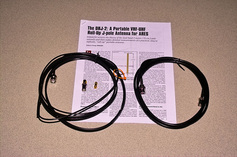 An article on this antenna was subsequently published in CQ - Summer Addition 2012. It has been granted US patent 8,947,313. This is a unique design which met the requirements of AC Daughty Inc. Some of the features include 5dB gain, only 4 ft tall, no radials, up to 150 MPH winds and yet cost only $40. AC Daughty Inc. uses over 200 of these antennas in a MESH network in New York. You can read the details in the attachments below. Overall Length: 4 feet, 50 ohm feed impedance, no ground radials. Antenna feedpoint is 10 inches above the connector. Thus U clamps, hose clamps, etc. can be used for mounting up to the first 10 inches of the antenna without affecting performance. Antenna offers “true” 2 element ½ wavelength phased radiator (centered tuned). Connector available in both UHF or N.
SWR: less than 1.3 to 1 over a 5 MHz bandwidth and less than 1.5 :1 over 10 MHz bandwidth. Biography - Ed Fong was first licensed in 1968 as WN6IQN. He later upgraded to Extra Class with his present call of WB6IQN. He obtained the BSEE and MSEE degrees from the Univ. of California at Berkeley and his Ph.D. from the Univ. of San Francisco. A Senior Member of the IEEE, he has 12 patents and over 40 published papers and books in the area of communications and integrated circuit design. Presently, he is employed by the University of California (previously at Berkeley and presently at Santa Cruz- Silicon Valley) as an instructor teaching graduate classes in RF design and High Speed interface design. During his 30 year career he has performed worked for Motorola, National Semiconductor, Phillips Semiconductor and Advanced Micro Devices.